but there's never been anything like the Beatles." -- Bing, TV Guide, Dec. 12, 1964. In a 1980 interview a few weeks before Lennon's death, Coleman asked Lennon what music he was currently listening to. He said, "Hank Williams, Carl Perkins, John Gielgud reading Shakespeare and anything that Bing Crosby had ever done." Lennon's friend, Elliot Mintz, in a televised interview marking the 20th anniversary of Lennon's death, elaborated on Lennon's interest in Crosby's music. "Yoko gave him this old-fashioned jukebox and John stocked it with Bing Crosby records. People kind of expected him to have rock 'n' roll records in there, but it was almost totally Crosby stuff. There were 3 songs which John played over and over. I still remember them. They were Crosby with a jazz quartet from the 50's, I think. He would banter and talk in the songs and John thought that was just the end. The songs were Whispering, I'm Gonna Sit Right Down and Write Myself a Letter and Dream a Little Dream of Me. Yeah, those were the songs, I can still see John listening to them." George Harrison developed an interest in Bing in the 1980s. On a nationally-syndicated radio show, Breakfast with the Beatles, Harrison remarked, "Bing Crosby was someone I discovered in my gardening period. He had a lovely voice, a presence that sort of crackles. He always remained popular over here [i.e., England]. I like his stuff very much." According to Harrison's son, Dhani, quoted in the October 2002 issue of "Beatles Monthly" magazine, an album of recordings by Bix Beiderbecke and Bing (Bix 'n' Bing) was his dad's favorite in his later years. 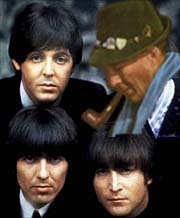 There is no evidence that Bing met any of the Beatles, but he did perform several of their songs ("Fool on the Hill," "Obladi Oblada" ...) on his television shows. His only commercial recording of a Lennon-McCartney song was "Hey Jude," the Beatles' biggest hit, on Nov. 21, 1968. It became the title song of his next album, Hey Jude, Hey Bing!. Bing's version of "Hey Jude" was released on CD in 1997 by Rhino Records under the title "Golden Throats IV -- Celebrities Butcher the Beatles." A special thanks to Candace Scott for her research.